modlandUSA: A Dollar? 99 Cents? The Trend for “Cheap”. A Dollar? 99 Cents? The Trend for “Cheap”. Ah, these are the days of discounted merchandise, outlets, and close outs. Around here, that’s Big Lots and also Tuesday Morning, where I once found a sheet set for $350, marked down from $1,100. Wonder if anyone bought them. Now it seems like our shopping experience has come to mere pennies now. Did the copper coin suddenly go up in value? I’m thinking it did because I’m finding myself counting them out to a cashier to pay for a container of household cleaner. 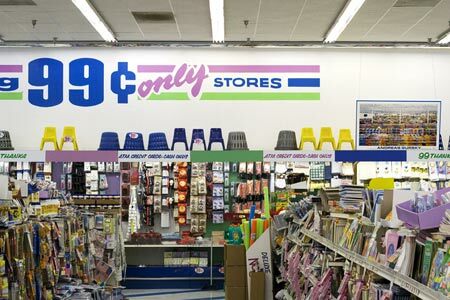 What was your first experience at a dollar/99 cent store like? Mine was actually pretty good and it happened about four years ago. Not sure what the name of the store was but I found myself grabbing things off the shelves in a bargain fueled daze. About two years later, I strolled into a Dollar Tree. I bought rubber bands that were dried out and they snap me to this day since I mistakenly mingled them with fresh ones. Other treasures included candle holders, Italian ice (FOUR for $1!) and plastic table cloth covers. Wow. 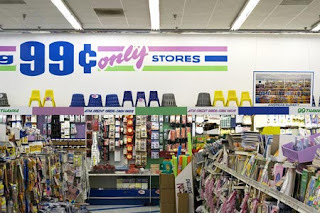 The condition of Dollar Tree stores varies; the one closest to me is fairly well kept while the one that’s another mile or so down the road is a disaster and could use a major gutting. 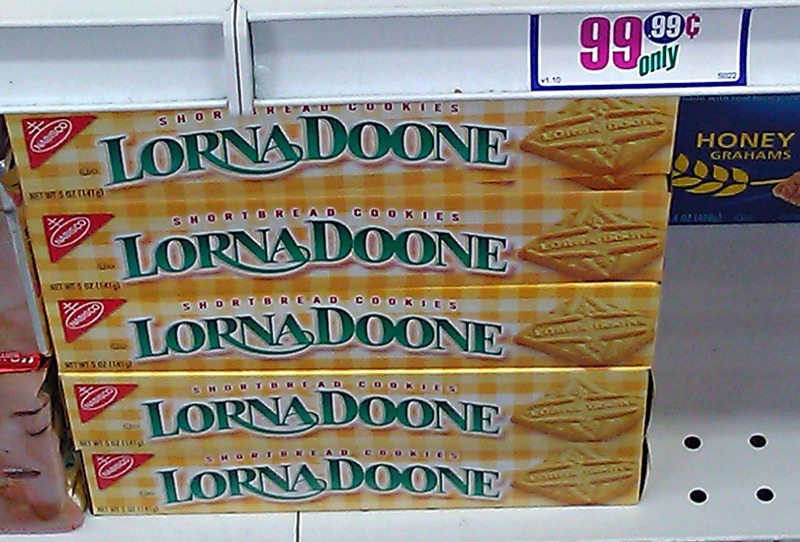 Now, I thought Dollar Tree was the king of them all. Until yesterday when I set foot in a 99 Cent Only store that had just opened, replacing the late lamented local discounter, Mainly Seconds. This chain is only (for now) in California, Arizona, Nevada, and Texas and seems to be growing at a fast clip. The parking lot was jammed. Uh oh. I expected to see the former interior of Mainly Seconds, just rearranged and holding cheaper merchandise. I was in for a surprise. The store was shiny and clean with linoleum checks on the floor and crisp white walls. The interior looked much larger than I remember. Classic Pop/Rock ‘n Roll was pumping in from speakers up above. 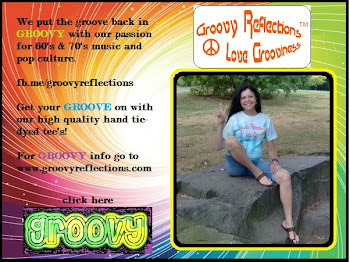 Hmmm…was I part of the target demographic? So I set out on my journey to pick up just a few items: Household ammonia, colored pencils, and a sketch pad. Found all three with ease. Moving towards a rear corner of the store, I hit a bottleneck. A crowd had gathered around an employee unboxing big, beautiful marigolds. Hands reached out (gimme gimme1) for each one as she pulled them out of the box. Wiggling past the excitement to the far corner I found “that right size” of plastic tray I was looking for. Flipping it over I was stunned to find that it was made in Israel. Then I found the uniqueness that guaranteed this store my business again. Fresh produce! Almost giggling, I scooped up a large plastic container of fresh organic spinach. 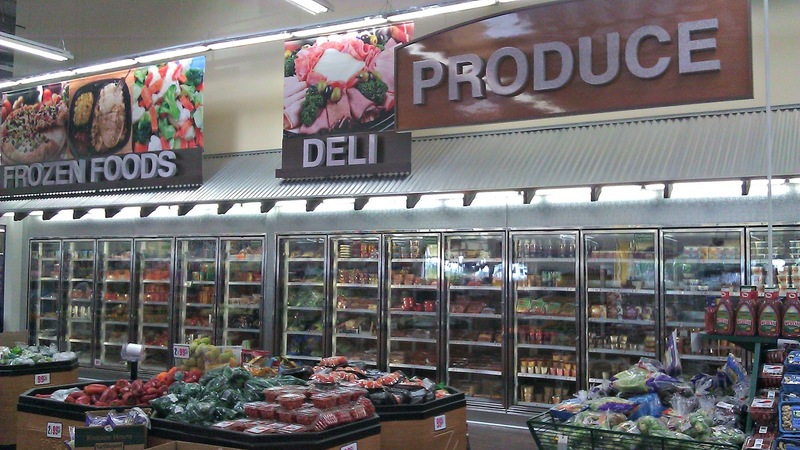 The fresh area of the store resembled a supermarket; frankly, I was blown away by it. They even had 99 cent blackberries! Marcal. That's a brand name I grew up with. 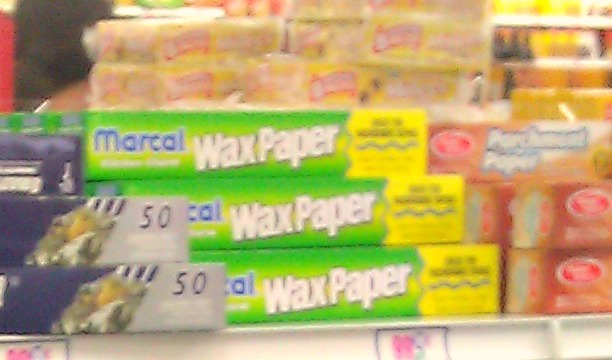 Paper products proudly manufactured in East Paterson, New Jersey (now known as Elmwood Park). I remember passing their factory many times as a child too and seeing that huge neon sign that said Marcal Paper Company on it. 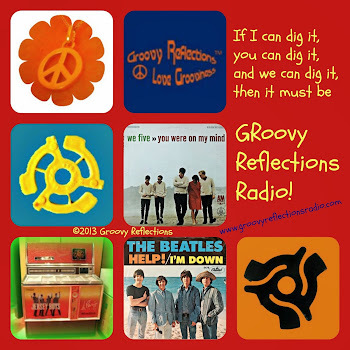 They were front runners in those days using recycled paper in their products. Had no idea they went national. Sadly, it was time for the fun to come to an end. Only three registers were open, and the lines were five people deep. But my line moved quickly. Lots of people grabbing helium balloons; had to step out of the way several times. A satisfied customer. Now to get to my sketching. 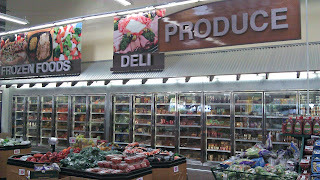 Yes, seeing the produce there was a shocker; it sure didn't look like a dollar store! Thanks for your comment. 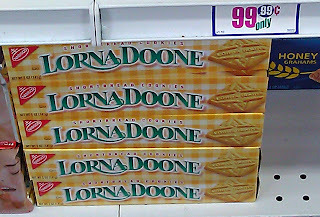 Lorna Doone's~ great blast from the past!